It's been over 10 years since the Rolfe Alumni Web site was first published. We have strived to recruit people to write essays, and toward that end, we have received pieces from about 60 people. The recruiting process was not an easy one, and most of what we have was submitted nearly a decade ago. Also, there were those people, including former faculty, who said they would write, but have not followed through. Then there are other folks such as Jerry Farlow (1955) and me (1963) who have written several pieces. In fact, we recently posted a new essay (or call it a story) from Jerry, and he says he has yet another that he is perfecting and intends to submit this spring. I often wonder how to proceed with the RHS site. Do I simply say, "It is the best of times and the worst of times" in terms of the vibrancy of the site? Should I respect the fact that there is a great body of material assembled on our site and that it is like having old copies of the National Geographic Magazine sitting next to the toilet at home or the couch at the summer cottage? The material in them is valuable even if neither current nor read often. Perhaps the question is one of "To be or not to be." Is it nobler for me to say that the site has had a good run with a fine following, but detach from it and devote my near- Medicare-energy to priorities such as gardening, tending my flock of five laying hens, organizing church dinners, and making YouTube videos? Or should I take up arms (well, I mean, pen or computer key board) to overcome a sea of trouble by dealing with inertia, becoming motivated, gaining focus and a voice? I guess I am game to keep on trucking with the site. But the success of the site depends not on one person but on our RHS community. I again encourage readers to submit material. You certainly don't have to meet Miss Marcum's or other Rolfe faculty standards. Oh, yes, we do have some guidelines about being civil and not submitting pieces that only insiders would understand. Even though RHS provided a good-to-great education for many people, I get the sense that a love of writing was not instilled in many of us. Instead, it seems that maybe many of us have been left with a fear of writing. But behold, I once heard at a University of Iowa writing workshop that the word "essay" means "to try." That's it. I was a little disappointed in so simple a definition. On the other hand, it does provide liberty and latitude. 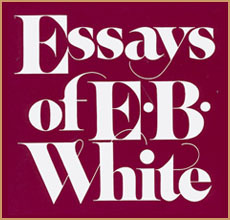 Recently, a friend loaned me Essays of E.B. White. The foreword to his book says some intriguing things about essays that are worth sharing. Perhaps I'll do more writing for this site, try again to get others to write, or record interviews so that those who like to talk but are resistant to writing can share stories or thoughts. But for now, here are excerpts from the 1977 foreword to E.B. White's essays. If you want to join the fun and submit material, send me an email. Or if you simply have thoughts about the site and its future, feel free to send them. Thanks. The essayist is a self-liberated man, sustained by the childish belief that everything he thinks about, everything that happens to him, is of general interest. He is a fellow who thoroughly enjoys his work, just as people who take bird walks enjoy theirs. Each new excursion of the essayist, each new "attempt," differs from the last and takes him into new country. This delights him. Only a person who is congenitally self-centered has the effrontery and the stamina to write essays. There are as many kinds of essays as there are human attitudes or poses, as many essay flavors as there are Howard Johnson ice creams. The essayist arises in the morning and, if he has work to do, selects his garb from an unusually extensive wardrobe: he can pull on any sort of shirt, be any sort of person, according to his mood or his subject matter-philosopher, scold, jester, raconteur, confidant, pundit, devil's advocate, enthusiast. I like the essay, have always liked it, and even as a child was at work, attempting to inflict my young thoughts and experiences on others by putting them on paper. There is one thing the essayist cannot do, though-he cannot indulge himself in deceit or in concealment, for he will be found out in no time. Desmond MacCarthy, in his introductory remarks to the 1928 E. P. Dutton & Company edition of Montaigne, observes that Montaigne "had the gift of natural candour. . . ."
I think some people find the essay the last resort of the egoist, a much too self-conscious and self-serving form for their taste; they feel that it is presumptuous of a writer to assume that his little excursions or his small observations will interest the reader. There is some justice in their complaint. I have always been aware that I am by nature self-absorbed and egoistical; to write of myself to the extent I have done indicates a too great attention to my own life, not enough to the lives of others. I have worn many shirts, and not all of them have been a good fit. But when I am discouraged or downcast I need only fling open the door of my closet, and there, hidden behind everything else, hangs the mantle of Michel de Montaigne, smelling slightly of camphor.